My daughter turned 3 months old a few days ago! I was concerned that my little one seemed to be fighting the techniques we were taught in speech therapy, so I took her to our hospital sponsored breastfeeding group to see the lactation consultant and weigh her before and after a feeding to test her intake. I was shocked and excited when the lactation consultant said she had a much better (wider) latch and she drank 3.6 ounces – her highest measured amount in her life – since she started with about 0.25 ounce this improvement is unreal! She also weighed in at 10 pounds 2 ounces – up 10 ounces in 1 month, lower than our LC would like to see – but, a gain none the less! Our LC noticed my daughter’s red eyes, splotchy skin, “junky” breathing, and green mucusy stool, and said she believes the lack of weight gain now is most likely to malabsorption caused by allergies – she suspects a dairy allergy. I have to admit, it is frustrating when each time we correct a problem, another is uncovered . . . but, thankfully, she seems to do better with each correction and each issue is less severe than the one before. I hope soon this will all be behind us! But, for now . . . I am left cheeseless! 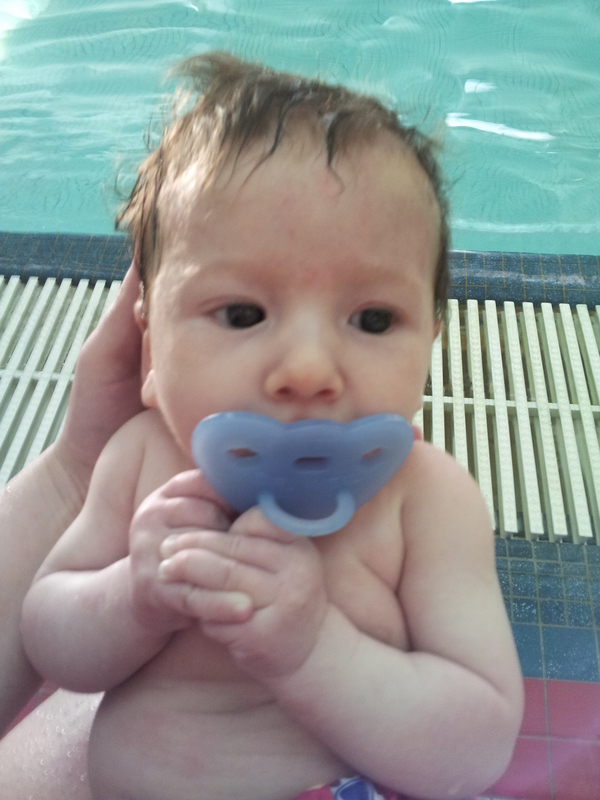 My 10lb 2oz 3 month old – she’s still itty bitty, but, that doesn’t stop her from having belly rolls…and going swimming!